"This CTJ report illustrates how profitable Fortune 500 companies in a range of sectors of the U.S. economy have been remarkably successful in manipulating the tax system to avoid paying even a dime of tax on billions of dollars in profits. These ten corporations’ tax situations shed light on the widespread nature of corporate tax avoidance. 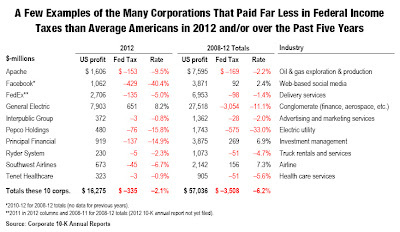 As a group, the ten companies paid no federal income tax on $16 billion in profits in 2012, and they paid zero federal income tax on $57 billion in profits over the past five years. 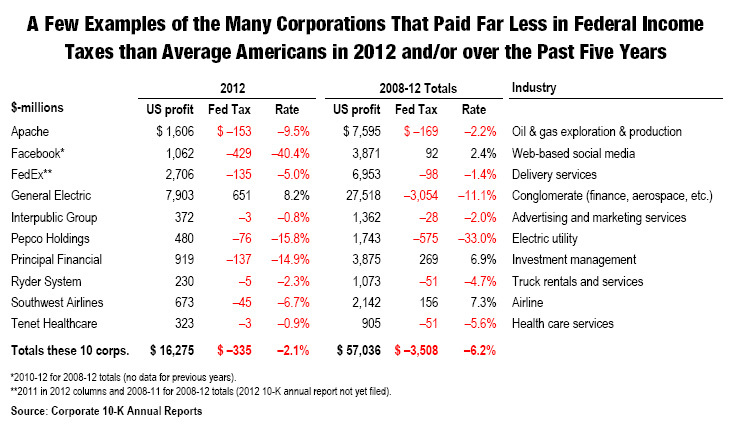 All but one paid less than zero federal income tax in 2012; all paid exceedingly low rates over five years." "As the New York Times documented, the director of GE’s tax department literally “dropped to his knee” when begging House Ways and Means Committee staff to extend the active financing tax break when it was set to expire in 2008." The Stop Tax Haven Abuse Act aims to close several different loopholes by deterring the use of tax havens for tax evasion and strengthening the enforcement of our tax laws. The bill would also require SEC-registered corporations to report annually on the number of employees, sales, financing, tax obligations, and tax payments on a country-by-country basis, shedding more light on the extent of use of tax havens. This bill also provides for additional penalties for failing to disclose offshore holdings and for promoting abusive tax shelters. The International Tax Competitiveness Act addresses a large and growing area of tax abuse: the practice of developing a trademark, patent, or copyright in the U.S. and then transferring that intellectual property abroad to avoid taxes on the vast income it generates. This bill would treat income from the U.S. intellectual property as U.S. income and tax it accordingly. The Fairness in International Taxation Act would end the current practice of treaty shopping to avoid U.S. taxes. The United States has tax treaties with a number of trading partners that reduce the amount of taxes that a U.S. based entity owes on interest and royalties paid to a foreign parent. Since many of these foreign parent companies are set up in tax havens, these companies now bypass U.S. taxes by routing the payment through a tax-treaty country that then just transfers the funds to the tax-haven parent. This bill would end that legal fiction and say that you only get the tax-treaty discount if the parent company is actually located in a tax-treaty country. “Policy Options to Raise Revenue,” CTJ, March 8, 2012. “Don't Renew the Offshore Tax Loopholes,” CTJ, August 2, 2012.